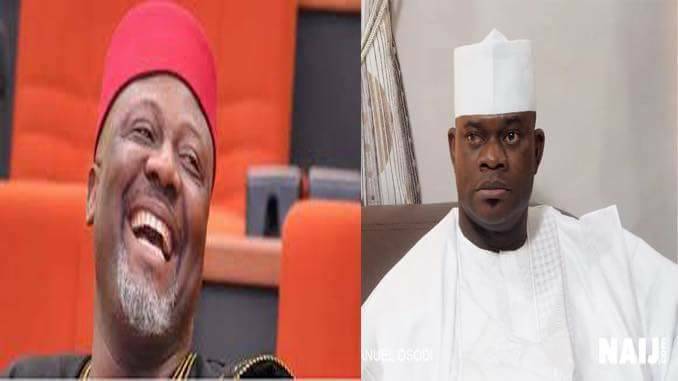 Kogi State Governor, Yahaya Bello, Thursday reacted to a video of Senator Dino Melaye, representing Kogi West, describing him (Bello) as a loser. Dino Melaye in a recently-released video on Instagram mocked Bello for trying to pull him down. Speaking with State House correspondents on the sidelines of the expanded National Economic Council meeting at the Presidential Villa, Abuja, Bello claimed that he had not seen the video as he was too busy to listen to a noise maker. Bello said, “I don’t know there is any such video from anybody, I am not aware. Maybe, you may tell me what the video is all about, I am not aware if there is any such video. “You see Kogi state is a very complex state and I took it over when things were really bad and I am doing my best to ensure that we give quality service to the good people of Kogi state. “So any noise maker out there is just disturbing himself. So I just focused on the job as the executive governor of Kogi state, and I am doing my best and the people of Kogi state really appreciate my services to them,” he stated. On the recent attack in Kogi, he said, “It was a very pathetic situation where about 12 people were killed and I visited that place. It is a place that was neglected by their own people and it was unfortunate that that incident happened and we have constituted Judicial Panel of Inquiry to look into the immediate and remote cause of that attack because this is not the first time that an attack is happening in that particular area. “In 2014 it happened where lives and property were destroyed but thank God with the support of the military, police and other security agencies were able to quickly move into action and then that particular incident had been stopped.